Yarra Valley ECOSS: Niree has been an active and contributing member of the Committee of Management, Community Engagement and Site Sub Committees at Yarra Valley ECOSS since 2013. The park is a community organisation committed to ecological and social sustainability, located on 7.4 hectares of beautiful land in the Yarra Valley 50 km east of Melbourne. 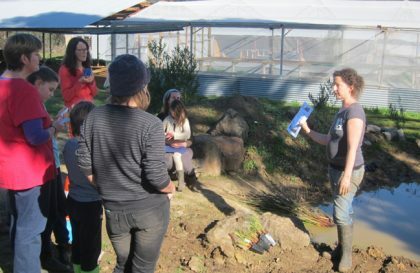 The NFP organisation boasts certified organic seedling and indigenous nurseries, co-location of local NFP organisations, an active schools sustainability education program, an ambitious permaculture based farm masterplan and collaborative natural building and other sustainability based workshops. http://www.ecoss.org.au/ for more information. Amongst other things Niree contributed to masterplanning and development plans, is the main liaison with council planning division, provided design plans for and managed the construction of an indigenous habitat “Frog Bog” co designed a future “conversation circle” and fire pit to be constructed by youth with challenges at school. Additionally she was co-creator of Ecotopia festival for 3 years, voted best festival in the Yarra Valley. CIRE Education: (formally Upper Yarra Community House) is a community education center. Niree was asked to prepare an indigenous planting plan to enhance the existing communal entrance space. It is anticipated that the construction will be carried out by the students as part of their curriculum. Warburton Wellbeing: A not for profit wellness center in the Yarra Valley. The organisation won a proposal to lease an old fire station from council to be converted into their new wellness and yoga studios after their former premises were sold. Niree has contributed landscape plans for the future development of the site to benefit the small businesses operating within the center and the broader community as the center sits in a prominent position with the the Warburton township.